Standard - $179.99 Only 5 left! Normally, when one thinks about a panda, thoughts like ‘cute’ and ‘cuddly’ come to mind. 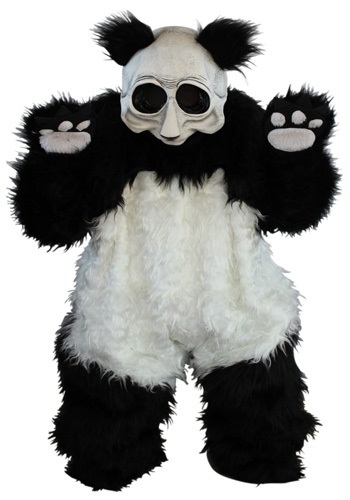 However, with this Zombie Panda Costume, everyone will be thinking ‘creepy’, terrifying’ and ‘get out of my way’ as they run in the opposite direction. Never before has a panda been someone’s worst nightmare, but you will change everything this Halloween. Zombies are pretty scary creatures and pandas have always been known as one of the cuter animals on the planet. You’d think when you mix the two that you’d end up that lands right smack dab in the middle of the scary/cute scale but no. It breaks the mold and is in a whole new level of creepy! Hop into this furry black and white jumpsuit, toss the haunting panda skull mask on, and your transformation is complete. No one will want to be stuck in a room alone with you, especially after they take one look into your pitch black eyes. The less you speak and the more you just stand still, the creepier you can make this costume. However, if you ever want to kill that creepy vibe it can be done in an instant. All you need is to do is shake your panda booty out on the dance floor. There’s no way anyone could be afraid of a dancing panda… even if that panda is also a zombie. Toss on this Zombie Panda Costume and let your Halloween celebration begin. No one will expect that an undead panda is the scariest thing they’ll see all night! Looking at the picture I was very confused, and to be honest I was not a big fan, but my wife is going as a scary clown, my 11 month old daughter is a cute little lion, so I got this one to go with our "circus" type theme. When I put this costume on in person, I was impressed, it's just so dang creepy! It is way better than what I thought it would be. It is something that would creep people if they see you walking down the street in this thing. Kinda Donnie Darko bunny rabbit creepy. The mask has very large, mesh openings making it very easy to see out of and nice foam pads inside that allows the mask to keep its shape. I am 6' and 225lbs and fit well into the costume. I don't think it would fit me if I was much taller....the shoe covers barely stretched down over my feet.